K and I went out for an evening walk outfit photos (We all know we don’t actually go for the walking part, right?) for the first time since I got back from my trip to the USA. It felt a little awkward after so long! Last week I ventured out to this spot on my own to practice a little with my newest camera lens. While doing so I got stung by either a wasp or a horsefly and my leg swell twice it’s size and I got a large bruise around the bite. My doctor says I’m allergic (No kidding, Sherlock!) and gave me the smelliest creme ever, haha. Too some people’s horror, I tweeted a photo of it after it happended, but I can asure you the smelly cream did it’s job and apart from an itchy spot my leg is fine now. Off to enjoy summer again! I haven’t been around the bloggin’ block that much lately. After the exams and my time off my social life came back knocking on my door and I like it beeing back full time. With our crazy thunder-y Belgian weather we mostely have to stay in and watch old seasons of Bones and movies on Prime, whilest drinking fresh raspberries smoothies and having the obligated discussion on how hot/not hot Ryan Gosling is, but still I get a really summer-y feeling. Also, meet my new best friend. This denim fella plays so well with my dresses and skirts that I can’t stop wearing it. When I first met him on Broadway I wasn’t too sure, but I couldn’t get him out of my mind and when we walked by and AE again a few days later I gave in and bought this overpriced beauty. I’m glad I did though, He’s a great cover up on a chilly evening and he’ll get me far into fall too! How’s everyone doing around here? 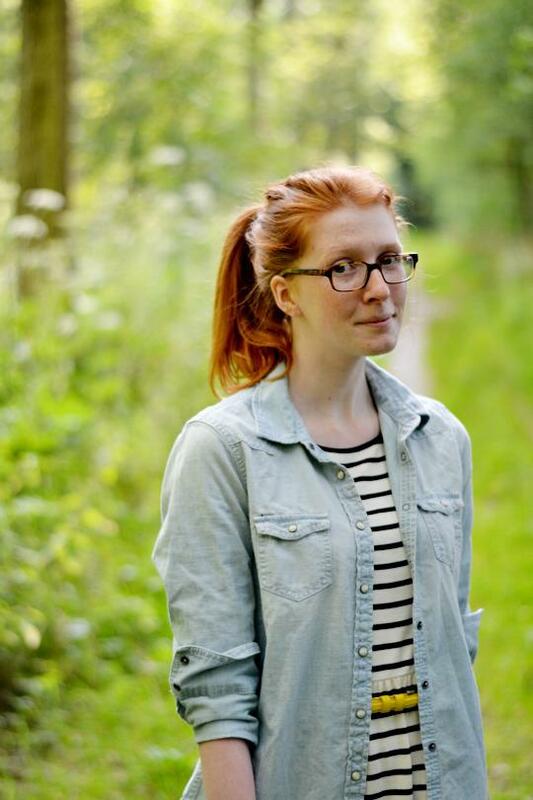 Toffe foto's, ya ginger hair is looking smoking hot! Oh, I'm sorry to hear that! I also tend to get "huge" spots when something bites me, even if it's a simple mosquito. Well, apart from that, the spot you discovered is really nice though! And I also love denim shirts, but I don't really wear mine very often… And your little yellow bag is so cute! Beautiful photos + outfit as always, you look like straight from a fairytale! 🙂 And that bench is supercute! Love the denim shirt – I really like the AE one they have but in the darker wash as well. I've been eyeing that one up recently. I think it would be a great transition item into fall but you're right, it's so expensive for a shirt! Oo poor thing! Stay away from outfit pictures in meadows where there'll be more bugs!! I like the denim shirt; I have one too that I use as a jacket all summer long. It's perfect for throwing over your outfit once the sun goes down! Love this outfit =D It's simple but really cute!! I love the pops of yellow in it especially =D Hope your leg's feeling a lot better now! LOVE that striped dress Nikki, especially with the chambray shirt – so cute! What lovely photos! Loving the one w/ you sitting on the log. And I have been going crazy for denim chambray tops too! They are just so versatile and can be worn in so many ways! You have a great blog! 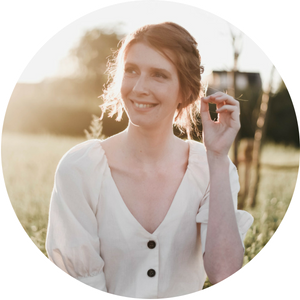 I'd love if you checked out my blog, and if you like it, can we follow each other? I promise I’ll follow you back! Oh no! I found out last summer that I was allergic to wasps too. Darn bugs! Congrats on the new denim blouse. I wear mine aallllllllllllll the time. Okay, okay, we were both just over at Just Take a Bow talking about leaving meaningful comments– but all I want to do is exclaim over how adorable you are! Your glasses! Your neon bag! On a (slightly less shallow?) note, high five on finding a shirt that works over this dress. I get the feeling the outfit would look a bit more formal without that completing piece: the denim keeps everything casual and perfectly summery. I want to try this, now! You have good reason to make that denim fella your new best friend. It would go great with everything! I love how you wore it over the stripes, and the outfit looks amazing with the pops of yellow. Awesome styling! great outfit; absolutely love your bag and belt! Hugs and a wonderful Friday to you!!! i'm glad your leg is better! and i looove denim shirts, i feel like they are the perfect thing to throw on top of a dress or tank during summer. 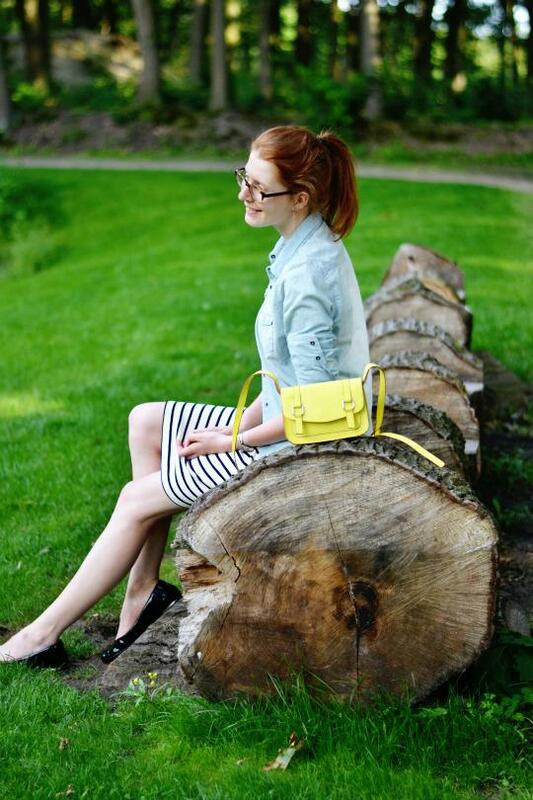 Lovely pictures – I like your yellow accessories and that shirt is a great layering piece. Glad your leg is better, sounds like it was pretty scary! That is definitely a closet staple and if you use it a lot you'll definitely get your money's worth out of it. Ik vind het echt leuk hoe je deze simpele outfit hebt gecombineerd met gele accenten, echt leuk! 1. I cannot seem to find a denim/chambray shirt that I actually like. Gimme yours, haha. 2. Yikes about the insect attack. I'm not allergic to those (yet) but my body freaks out when I get mosquito bites. 3. Hopefully blogging doesn't continue to feel awkward! Heel mooi, denim met streepjes. Ik hou van deze stijl. Balen dat je bent gebeten :-(. Zo eentje wil ik ook nog, ik vind die denim jasjes namelijk echt geweeeeldig! 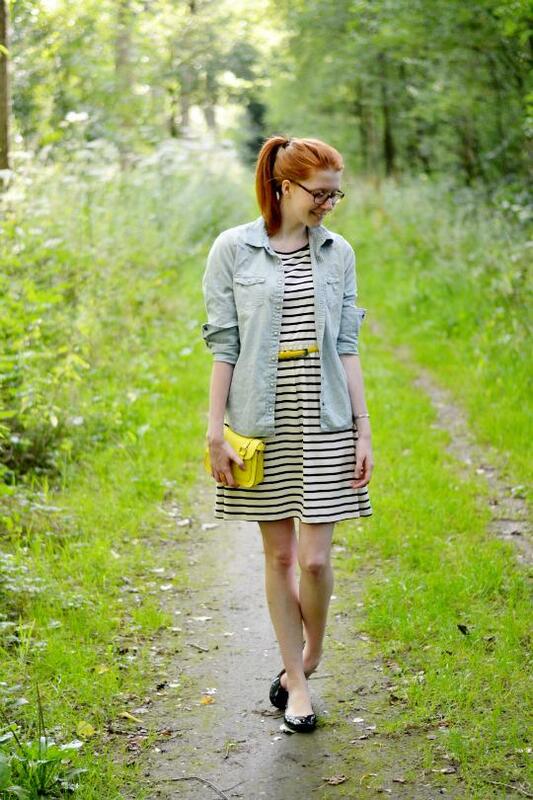 Your denim top works perfectly with your striped dress! A classic combination!